The Cookbook Profiling Tool provides a small library that can be bundled with a BD-J application to provide execution-time profiling. Execution-time profiling is an extremely valuable technique for developing fast, well-optimized software. The BD-J environment presents a challenge, because meaningful performance measurements must be made on commercial hardware. BD-J application developers rarely have access to VM-level debugging tools, such as execution time profiling tools, on such players. Further, the resolution of the system clock available to applications on BD players is not very good - no more than 1ms, and often 10ms or more. This limits the usefulness of direct application-level measurement. We have addressed these limitations by creating a profiling framework that generates UDP packets on the BD player and sends them to a PC. When the packet is received, software on the PC timestamps the packet using the higher-resolution clock offered by System.nanoTime(), which was found to have a resolution no worse than 1µs. We've had very good results collecting measurements with this tool. We recommend running it on a quiet LAN, with wired connections directly to the router for the player and the PC. To profile an xlet, the xlet's JAR just needs to be built with the PROFILE flag of com.hdcookbook.grin.util.Debug set true, and it must include calls to the profiling facility in com.hdcookbook.grin.util.Profile. 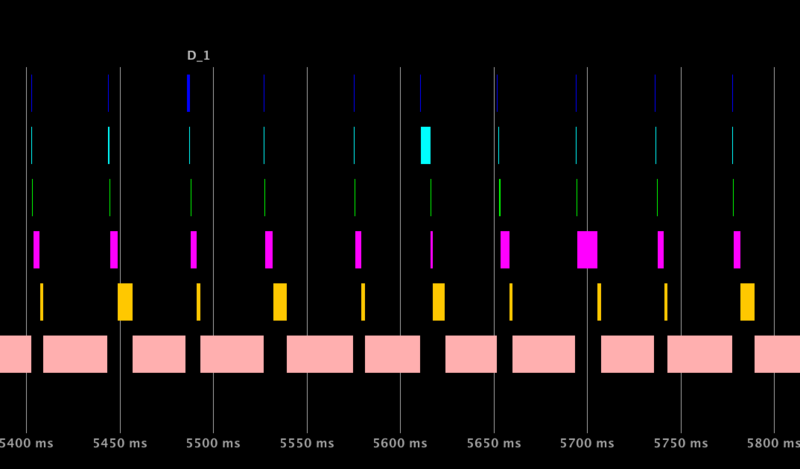 Profiling timers are already built into key parts of the GRIN animation framework and the setup manager, but a developer may wish to add more where needed. We've found that 150 timer executions per second is fine, but that thousands of timer executions per second becomes disruptive to the xlet under test. Below is a graphical timeline of a 23 second long run of the GrinBunny game, produced by a crude prototype visualization tool in AuthoringTools/profiler. By the time you read this, a more sophisticated visualization tool may well be available; check in that directory, and run the tool against the profiling data in sample_profile.dat, which is illustrated here. Data runs from 0ms to 23068ms. Displaying from 0ms to 23068ms. It's hard to make much of this data without zooming in, but we can already see some interesting things. The blue advanceModel() bar shows the director's Java scripting code that contains the game logic, and we can see thin vertical bands where it runs for each frame. Cyan represents the optimized drawing calculation done by the GRIN scene graph, and green the time spent erasing the buffer used for double-buffering. 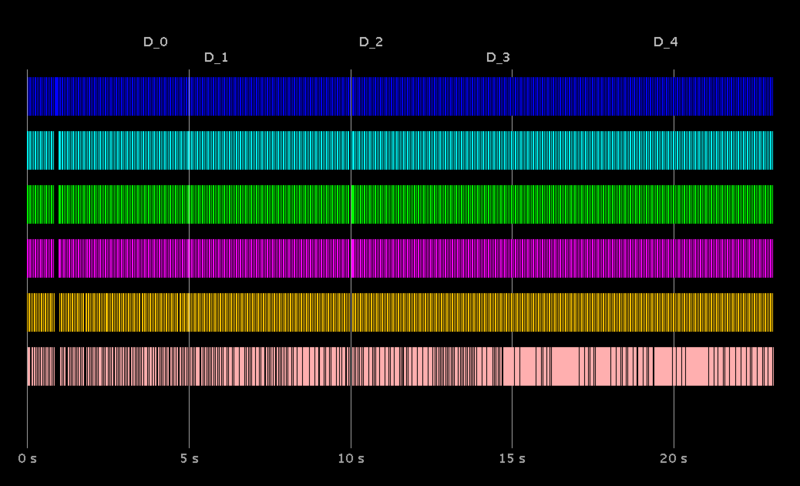 Magenta is the time spent drawing to that buffer, and orange the time spent copying that buffer to the player's framebuffer. Finally, pink represents the time the thread sleeps, waiting for the next frame to be drawn. A block of time is displayed with a minimum thickness of one pixel, so we can't make much of the density of the lines, but we can already see that the bulk of the execution time seems to be spent in idleWait() (pink), which is good. This shows that we're not stressing the player, or falling behind. Displaying from 5400ms to 5800ms. Here, we can clearly see that the majority of the execution time is, indeed, being spent waiting for it to be time for the next frame. The GrinBunny game isn't very demanding, but we should also point out that this profiling data was collected on a very fast player, and it may not be representative of a typical consumer player. However, even on a slower player, we expect that a good percentage of GrinBunny's time would be spent in idleWait(). Another interesting data point is the time spent calculating the optimized drawing areas, shown in the cyan damageCalculation() bar. This process is normally very fast, but you can see that there's an anomalous reading at approximately 5.6 seconds (in the middle of the plot). This might just be a short generational GC run, contention with other network traffic on the LAN where the test was run, or some other transient problem unrelated to the BD-J application. However, if a pattern of such occurrences could be established, this might indicate an area for further work. Another interesting observation is that the green eraseBuffer() bars are consistently much narrower than the magenta drawToBuffer() bars. This is despite the fact that erasing the buffer touches more pixels than drawing the various images into the buffer. The latter involves more draw operations, so this confirms that on modern hardware, drawing time is frequently more sensitive to the number of drawing operations than it is to the number of pixels touched. Of course, it must be remembered that the time when a method call completes is not necessarily when the hardware finishes the operation in question, so these conclusions should not be viewed as absolute. Using this profiling framework based on UDP packets, you can gain valuable insights into the performance of a BD-J xlet. Sending UDP packets that are timestamped on reception with a PC's high-resolution system clock has yielded good data that has helped to understand the performance of production BD-J software. Further, our measurements indicate that the GRIN animation framework and scene graph have performed as expected, adding little discernible overhead to the time spent doing double-buffered direct draw. We hope that this flexible, application level profiling framework is found to be useful.